At the age of 13 he enrolled in Leiden University but soon left to pursue art, first as an apprentice to a history painter in Leiden and later under the tutelage of Pieter Lastman, a famous artist in Amsterdam. Returning to Leiden, Rembrandt opened a studio – while still in his teens – with his friend, Jan Lievens, who had also studied under Lastman. By the end of 1631, Rembrandt returned to Amsterdam, having accepted a commission from a well-known physician in the city. He lived with Hendrik van Uylenburg, a successful art dealer, whose cousin he married in 1634. Rembrandt’s marriage to Saskia van Uylenburg was a benefit to his career, providing him access to wealthy patrons who eagerly commissioned his portraits. As his career flourished, Rembrandt’s private life was beset by tragedies. Of the couple’s four children, three died before reaching the age of three months. The artist suffered more heartbreak when Saskia died shortly after the birth of their son, Titus, who lived to adulthood – but would pre-decease his father. After Saskia’s death, Rembrandt hired Geertje Direx to care for his young son. When the relationship soured – leading to a legal battle – he turned to Hendrickje Stoffels, who eventually became his common-law wife. While the couple’s first child died as an infant, their daughter, Cornelia, survived. Having lost his wealth, Rembrandt moved with Hendrickje and his children to a small cottage on the outskirts of Amsterdam. 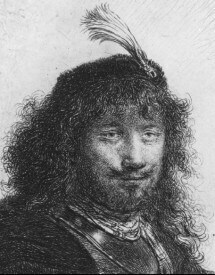 He outlived both Hendrickje, who died in 1663 at the age of 37, and Titus, who died in 1668. Within a year of his son’s death, Rembrandt died – on October 4, 1669 in Amsterdam – and was laid to rest in an unmarked grave in the Westerkerk. In many ways, Rembrandt’s etchings are more important than his paintings. He revolutionized a medium that was, in his day, simply a copyist’s tool. Rembrandt painted portraits to sustain himself financially but he made etchings for his personal pleasure, to extend the potential of the etching medium, and to feed his desire for continual creativity. He carried with him a copper plate as most artists carry a sketchbook. In etching Rembrandt allowed himself to create freely without the academic restraints of his day. Rembrandt was the great master of the Baroque Age, a time known for a style with dramatic application of light and shadow – a technique called “chiaroscuro.” He remains one of history’s most innovative and influential original printmakers. He created more than 300 etchings in his lifetime, many of which he labored over obsessively, often resulting in multiple states or variations in the evolution of an etched image. Scholars have divided his etching output into different categories according to subject. Each reveals a different facet of Rembrandt’s personality. His portraits, including his self portraits, reveal the complexity of his psychology and reveal his general moods over the years. His many religious etchings demonstrate a vast knowledge of both testaments, while his beggar and genre scenes are still being analyzed for their meaning and intent. Rembrandt’s contributions to the medium of etching have inspired countless artists, including many of the most important etchers of all time like Goya, Whistler, Chagall and Picasso. More than 350 years later, his etchings continue to astonish us in their virtuosity, insight and dramatic presence. To learn more about the Rembrandt Collection at Park West Gallery, please visit http://rembrandt.parkwestgallery.com.